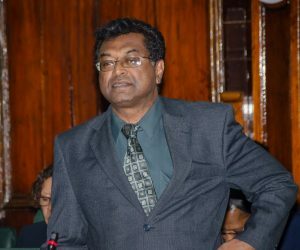 Chairman of the Alliance For Change (AFC), Khemraj Ramjattan Thursday admitted that government’s failure to appoint several constitutional commissions was unsatisfactory but he stopped short of openly criticising the government or explaining the reasons. He urged Ram and other critics not to view the situation as undemocratic because government has started the process for appointing the Local Government Commission and the Service Commissions. The Minister noted that the electorate always enjoys the option of voting the government out of office. “In relation to your question about serial violations, constitutional law always has as the ultimate penalty the loss of government. You do not cut out the hands of a politician because he has violated the constitution. You do not do anything physical to him…It is the people, now, will determine they made serial violations, out they go and that is what is always the case,” he said. Ramjattan promised that the AFC would fight hard to get constitutional reform, saying that campaign played a crucial role in winning the May 2015 general elections. Former AFC Chairman, Attorney-at-Law Nigel Hughes, who described himself as a “retired politician”, said the government could be taken to court to secure rulings that are binding on the executive. “Where they fail to respect the constitution, they should be taken to court. You don’t need a sanction because I would hope that we live in a country where, if the court declares that the government has failed, then whichever government is in office, if they don’t accept that ruling, then I would hope that they would not wait for the next elections, they would go the next day,” he said. Hughes said Guyana’s constitution is the most advanced in the Caribbean but enforcement is a major problem. He believed that the legal community is “not sufficiently agitated” to take the government to court. The Human Rights Commission has not been appointed since 2001 because of failure by the then President and the Opposition Leader to arrive at a consensus on who should make up that body.